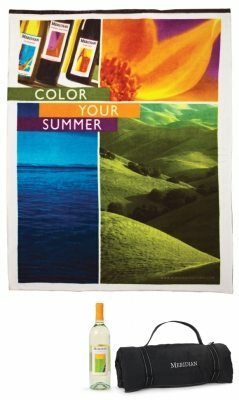 For a completely custom blanket design, take our popular Explorer and combine it with a custom printed fleece interior. Our polyester fleece can be screen printed with up to 10 colors. This allows for extra detail where required. The dyes are fully cured and sublimated, therefore guaranteeing a fabric that will maintain its soft hand and also a print that will not deteriorate with subsequent washings. Water-resistant, PVC-coated polyester picnic blanket. High-performance Kanata printed fleece interior. Roll-up convenience with Velcro closure and contrasting stitch detail. Embroidery friendly, as it is embroidered before it is sewn together. Custom designs available with minimum requirement of 1,000 pieces. Priced from $25.42 each (C). View our full custom range. For a completely unique item, take our popular Explorer and combine it with a printed fleece interior. Our polyester fleece can be screen printed with up to 10 colors, which allows for extra detail where required. 45″ x 58″. 100% polyester. Please contact us to discuss pricing.